I think it would be neat if Sony would make some sort of combining quest for all of the trophies you've obtained once they've been completely evolved. Of course, they'd have to write a program that would configure which TS's are available to which character, but that should be easy enough. Combining the trophies would certainly take up less space in the bank than having a whole bag full of them! And besides, the Effect of summoning a bag is the same. Just have the final piece include all of the stats from each trophy. What do you think, fellow tradeskillers?? From what I understand, you can not simply get a Brewmaster's Mug. At 300 skill, You will still get a Master Brewer Trophy. 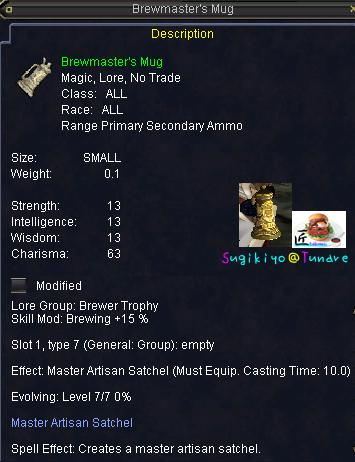 No matter what type of Brewer Trophy you have though, you will need to evolve it into a Brewmaster's Mug on your own by tradeskilling until it gets enough experience. What is the skill lvl u have to be to get this?